As a young Nevadan, Doug grew up in an outdoor atmosphere and intrigued by the Old West. 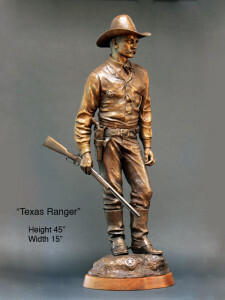 As a teenager, he was presented a carbine, like the Texas Rangers used, by an old government trapper friend named Bill Edmunds. They traveled and explored the backwoods together. Researching this sculpture was a labor of love that brought back many fond memories of his younger days. The elk ivory hanging from the pocket watch fob is on of Doug’s treasures.